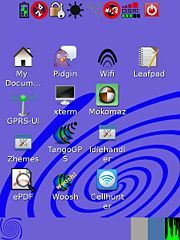 neovento is a [[Debian|Debian on Freerunner]] based [[Distributions|distribution]] which uses [http://lxde.org/ LXDE] and [[Zhone]] on top. 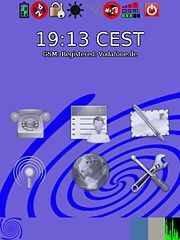 It is a [http://freeyourphone.de FreeYourPhone.de] community project. * use the recommended kernel. * use Qi as bootloader. To get usb networking, find out the interface name (eth?) by "ifconfig -a" and exchange usb0 with it. * make and use a [[SwapSpace|swapfile]] on your µSD (warning: this may destroy the µSD card after uncertain time). For that you can make the first partition ext2, > 128MB and use the createswap.sh script. * save the TangoGPS map files on the µSD as there is little space left on the NAND. * Join the [http://88.198.93.221/wiki/Talk:Neovento talk] to find out about tested programs, issues, and to contribute to development. 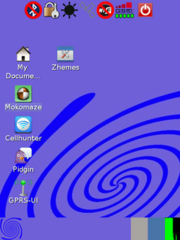 * You may want to remove pidgin, mokomaze, cellhunter, or anything else to free the space. However be careful since, for example, removing the PcManFM can mess up the distro and it cannot boot/load anymore. * [[Zheme_changer_script | This]] is a new version of /usr/bin/zhemes.py that I've modified. It creates the buttons based on what sub-directories are found in /root/.fyp/zhemes .